Our guide walks you through the full cost of buying a house or flat, from major expenses, to small outlays. How much does it cost to buy a house? While you might be aware of the major costs involved in buying a house, there could be extras you haven't considered. It’s not just forking out a deposit. Among the additional costs that need to be covered are legal fees, surveyor’s fees, stamp duty and moving costs. This guide will help walk you through the true cost of buying a house so that you don’t get caught out. 1. What deposit will I need? The biggest chunk of cash you'll need to factor into the cost of buying a house will be your deposit. The minimum deposit required is typically 5% – both on standard mortgages and through government schemes such as Help to Buy. As a rule of thumb, the bigger the deposit you can put down, the more likely you are to secure a mortgage with a lower interest rate. 2. What does a valuation cover and how much does it cost? If you are arranging a mortgage, the lender will need to value the property you're buying to ensure it's adequate security for the loan. Not all lenders will charge for a valuation as they are sometimes included in your mortgage deal. If you do need to pay, the cost will vary depending on the value of the property. On a £300,000 home for example, a typical cost will be around £200. In Scotland, valuations work differently as they are included upfront in a home report. The lender may also ask for the mortgage valuation to be updated if it's older than three months or if it was completed by a surveyor that is not on their approved panel. 3. What are mortgage arrangement fees? You may have to pay your lender (the bank or building society) a fee for arranging the funds for your mortgage. And it could be a considerable part of the cost of buying a house. That’s because the amount varies according to the lender and the mortgage deal and can range from nothing at all to several thousands of pounds. Arrangement fees can be added to your mortgage, but keep in mind that you will then have to pay interest on that amount. Often deals with the lowest interest rates have the highest fees attached. The low rates are designed to catch your eye, but you can work out the true value of the loan by comparing the fee, interest rate and length of the deal. 4. How much are conveyancing fees or solicitor fees? To help you through the property buying process, most of us hire a solicitor to handle the legal aspects of the purchase, otherwise known as conveyancing. Their responsibilities usually include drawing up contracts, dealing with Land Registry, sorting out the payment of stamp duty and transferring the payment for your property. Fees for these services vary, but you should allow up to £2,000. It is advisable to get a quote upfront before the solicitor does any work. Some solicitors charge by the hour, while others will do the job for a set amount or calculate their fee as a percentage based on the price of your property. Additionally, your solicitor will also carry out searches to check that there aren’t any planning issues like new roads or developments being planned that could affect your new home. These searches also include checks for any issues with rights of way, the environment and clauses linked to the use of the property. Costs are usually included in the solicitor's fee, and unless there's something seriously amiss or time consuming, estimate from about £200 to £300. 5. What is the Land Registry fee? Your property has to be registered with the Government's Land Registry department. A fee is charged, depending on the value of the property and will range from £40 and £910. 6. What are the costs of surveys? There are several different surveys available that come at prices relative to how comprehensive they are. The type of survey required tends to vary in accordance with the age of a property. The older the building is, the more important a detailed survey becomes. A survey can be particularly important if the property is listed, in a tired state or is in an area where there are concerns about flooding, subsidence or anything else that could affect its stability. A condition report would be the most appropriate option for a newly-built property or a property in excellent condition and normally costs around £300. Modern properties and standard older properties that have been maintained fairly well are best suited to a homebuyer report. Prices will typically start at around £350. If you are buying an old or unusual property or planning to do extensive building work, then a full building survey is likely to be required. A building survey is the most expensive but detailed option and prices usually start from £500. 7. How much are stamp duty fees? Stamp duty land tax is a tax charged on purchases of houses, flats, land and buildings in England and Northern Ireland. There are similar taxes in place on buying property in Scotland and Wales. It can be a fairly big chunk of the cost of buying a house, so it's important to factor it into your budget. The amount of tax buyers pay varies depending on the price of the property. Purchases that cost less than £125,000 are exempt from stamp duty in England and Northern Ireland. However, if you are a first-time buyer, the first £300,000 of a property's value is free from stamp duty - unless the home is worth more than £500,000. Following an overhaul of the system in December 2014, stamp duty rates now only apply to the amount of the property price that falls within each tax band. For example, on a property costing £195,000 you would not pay any tax on the first £125,000 and 2% on the remaining £70,000, meaning that you would pay a total of £1,400. Use Zoopla's stamp duty calculator to work out how much tax you will need to pay on your property. In Scotland, you pay Land and Buildings Transaction Tax (LBTT) when buying a property. Scottish property purchases up to £145,000 are not taxed. There is also relief for first-time buyers in Scotland, who pay no LBTT on the first £175,000. In Wales, stamp duty has been replaced by Land Transaction Tax (LTT). It’s payable on property that costs more than £180,000. Like stamp duty, you pay different rates on different portions of the property value. There is no exemption for first-time buyers. For purchasers of second homes, stamp duty costs are now higher thanks to a 3% surcharge. Find out more with our Q&A. 8. How expensive is it to use a removals company? Moving can be a relatively inexpensive part of the cost of buying a house if you do it yourself with family and friends and stretch up to several thousand pounds, depending on how many services - packing for example - you sign up for. 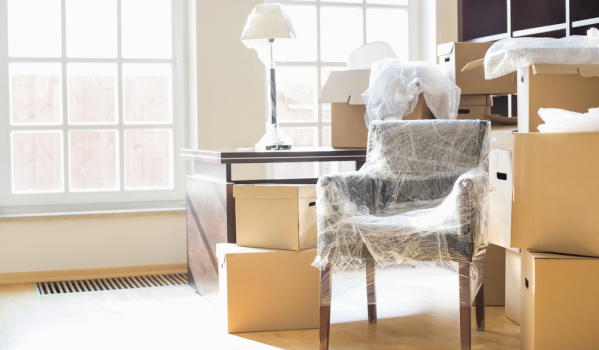 If you go down the route of using a removals company, a useful tip to save money is to de-clutter as much as you can before you get an estimate from them. They charge you according to how much stuff you have, so losing a good amount of it before they come around to assess your belongings could save you a good deal of cash. 9. What else needs to be factored into the cost of buying a house? Depending on your current living situation, you may need to buy a lot of furnishings. The cost of a new bed, sofa and dining room table can easily add up. It is also easy to overlook items such as curtains, carpets and paint and it is also worth double checking if there are any white goods (washing machine and fridge for example) included in the sale of the property and making sure they are noted in the contract. 10. Is it worth having home insurance? There are two types of home insurance: buildings insurance and contents insurance. Most lenders will require that you have buildings insurance so that you are covered in the event of structural damage occurring to your home. This type of insurance typically protects you from having to pay out against events such as flooding, a fire or subsidence. Contents cover is also worth investing in and will ensure that your furniture and personal belongings are protected in the event of incidents such as theft or a fire. The amount that you have to pay for home insurance will generally depend on factors such as the size of the property, its location and how much cover you want for your possessions. If you are buying a leasehold property, it is possible that the cost of building insurance will be included in your service charges. To find the best deals on home insurance shop around on comparison websites like uSwitch. 11. How much is council tax? If you are older than 18 and own or rent a home, you will have to pay council tax annually. The money you pay towards council tax funds local services such as the police, the fire brigade, rubbish collection, libraries and transport. The amount of tax you pay is determined by the valuation band your property falls into and the area you live in. In England and Scotland there are eight different tax bands, while in Wales there are nine. Northern Ireland does not use this system at all, as they work out their domestic rates based on rental value. To find out how much tax you will have to pay, check the Government website. In some instances, your tax band may be re-evaluated, and it could change. Among the reasons for a tax band change are if you make major alterations to your property such as adding an extension or an annex - although the band will not be updated until the property is sold. Other potential changes could occur if you split your property into self-contained flats, or convert flats into a single property, if you start or stop working from home, or if there is a significant change to your local area. Discounts may be available on the amount of council tax you have to pay. Reductions are typically available for those that are single, disabled, on a low income, not living in their home or using the property as a furnished holiday home. To find out if you qualify for a discount or a reduction have a look at the Government websites. the property is used as accommodation for those in the armed forces. 12. What are leasehold costs? If you buy a property with a lease, you will have to pay ground rent and service charge to the owner of the freehold. These fees normally fund the upkeep of the property and its communal areas. 13. How expensive will the utility bills be? The main components of utility bills are gas, electricity and water. The cost of these services will vary depending on the size of your property and how much they are used. It is a good idea to check with the previous owners or tenants how much they were spending on their utility bills each month to give you a rough idea of what you will pay. Zoopla's Running Costs tool will also help you estimate outgoings. What research do I need to do before buying a home?